Most mornings there is at least a small protest at getting ready for school. Most of the insurgency is easily quashed with a gentle reminder that school important, school is where their friends will be, and that Mommy is putting a few Oreos into the lunchboxes this morning. Some days I just have to put my foot down and demand they march upstairs and put some clothes on already before I break out my spanking hand. Other days they craft more cunning plans. They have headaches. Or stomachaches. And maybe it's just my jaded I've-been-there-tried-to-do-that, but I'm not falling for it. Maybe they really DO have headaches, (which is more likely) or the imaginary ailments that come from being around someone with a headache (those spread around our house like wildfire- oh YOU have a stomachache, well what do you know, so do I!) In any event, it is hard to suss out the real problem and troubleshoot in the hour before the bus heads off to school. - come to think of it, those are the only two I can think of! - maybe a really terrible looking rash? - a cough heard the next zip code over? There are, however, so many illnesses in between! Ones that bleed into the next, and if I kept them home for every runny nose or headache, they'd be de facto homeschooled. This lands us to where we were last night; I had just picked the twins up from the bus stop at Squirt is most definitely wilted, and Bunny is complaining of a headache. She doesn't think she can walk home. But since I walked to the bus stop we don't really have any other choice. I offer them a very rare treat (an act of desperation on my part) of cookies & milk when we get home. As soon as we get in the door, both girls plop onto the couch in a manner reminiscent of an amorphous solid. They request the milk and cookies be brought to the couch. I suggest we try some homework and we don't get very far. I can see things are unraveling, and I am simply not going to stand for it. I whip out the thermometer. Surely my good friend Mr. Beep will assure me this is all an act! He'll flash his little green light and we can all sigh some relief knowing that it's nothing major. He beeps three times and flashes 99.5- ORANGE. His three tiered warning system is much like a traffic signal, green is good, orange is a warning, and red means I will be chained to a house and a whiny sick child for a length of time... bad. Mr. Beep is not on my side tonight. Traitor. I dumb down the menu for the night. (hahahaha, had YOU going, didn't I!) It was always going to be hot dogs and broccoli. At least I didn't plan for chili or anything even remotely spicy. By the time 6:30pm rolls around, Bunny has eaten one floret of broccoli and decided she would rather just go to bed. Squirt eats two bites of the hot dog. Decides she doesn't really like hot dogs (I know this, but it's in your brother's top five list, so tough luck tonight) and eats two helpings of broccoli. 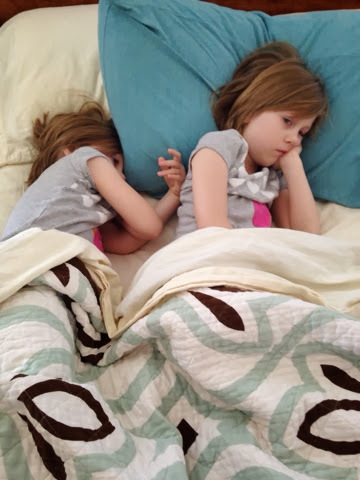 I let her and brother watch a movie to keep them quiet while Bunny sleeps until Actual Bedtime. This morning arrives and I greet it with much trepidation. The girls are white as ghosts, eyes rimmed purple, they look like death. Nobody wants to eat. Not even toast. I coax them into getting some apple juice down and summon Mr. Beep to make the final call. It's blatantly obvious at this point. They are sick. A fever will prove the case and I will keep them home. Of course it is physical therapy day, so I'll have to cancel the myriad of plans I've made for that, but whatever. Mr. Beep must be in a real mood today because his ruling comes back GREEN. For both girls. Not a fever between them. Impossible, I argue. He just stares blankly back at me. (Mr. Beep can be a real jerkface) Well now we have a REAL dilemma. Do I send them to school or no? If I keep them home will they perk up an hour after school starts and drive me bonkers the rest of the day? It's obviously impossible to tell the future, so I invented a relatively fool-proof test (I even used a control group for accuracy!) to help me make the best call possible. Turn the television onto something really boring, like the morning news. Set everyone on the couch. Leave the room, taking the remote with you. Observe from a reasonable distance and draw conclusions. In my scenario this morning, Bunny stayed on the couch glassy eyed almost watching the news. Squirt read a book, but stayed in the living room. Little Man (the control subject) ran off into the playroom, then upstairs, then back down, playing with multiple toys on his route. My conclusion being: if they don't go play on their own, they're too sick for school. Had they gone off with Little Man for a bit, like they most likely would have done on a normal day, I'd have sent them off to school. Now I must go. The sick bed is calling for snacks. Also. The sick bed looks like this. Quite pathetic and heart tugging.